A Matter of Fact is the second and last album by soul/disco trio Facts of Life. Produced by Millie Jackson, the album features a cover of Larry Santos‘ pop tune, “We Can’t Hide It Anymore“. “A producer usually doesn’t write liner notes, but never being known as shy, I’ll take a chance. The Facts of Life were my inspiration to be a singer myself. They are raw soul in its natural state. This album contains feelings that usually do not appear on records and only once in a while in concert. 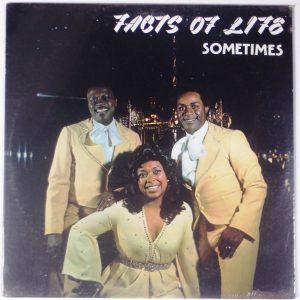 A killer album of southern soul harmony from The Facts Of Life – a trio with one female singer, two guys, and a great sound overall! The album’s actually produced by Millie Jackson – and has that great blend of modern and southern modes that she was hitting in her best mid 70s years. The sense of interplay and harmony between the singers is a bit like Soul Children at their height – and the album’s also got some warm Muscle Shoals backing that really makes the whole thing come off right! A Soul trio, based in New York and Chicago, formed by Millie Jackson. As a group they were first recorded under a name The Gospel Truth. Their first record under that name was “Up Hill Peace Of Mind”. Keith Williams has sung with Little Anthony & The Imperials and was the lead vocalist on the record “Buffalo Soldier” with Flamingos. Jean Davis is sister of Tyrone Davis. Chuck Carter was a solo 60’s singer, recording singles like “Pretty Little Brown Skin Girl” and “A Teardrop Fell”.